One of Pacific Palisades’ two current honorary mayors now has foot and handprints in the courtyard of the Chinese Theatre in Hollywood. The other co-honorary mayor provided a kiss at the ceremony. 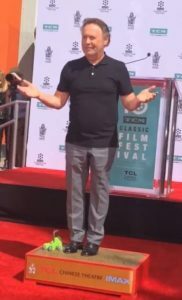 Turner Classic Movies selected Billy Crystal for the honor to be given at the 10th annual TCM Classic Film Festival. 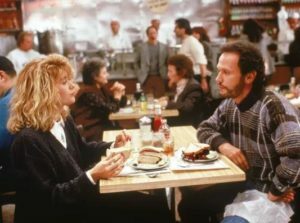 The festival kicked off Thursday with Crystal joining Meg Ryan and director Rob Reiner in a discussion of “When Harry Met Sally,” which was released 30 years ago. The hand and footprint ceremony was Friday. But Crystal said “the most important person” is his wife, Janice. That got applause from the crowd who showed up for the ceremony under the bright late-morning sun. He then recalled the first time he saw Janice. Crystal has had quite a career, which includes hosting the Oscars nine times – the first in 1990. That played into his wardrobe choice for the ceremony. After signing his name in a block of wet cement, Crystal’s hand prints were next. He then lifted his hands up. And with wet cement still on his palms, he displayed them for the crowd and for the news photographers. Next was a quick walk to where his wife was sitting with their family. Billy and Janice Crystal leaned in for a sweet exchange of kisses. Back at the wet cement, Crystal stepped up and made an impression while wearing those painful, but meaningful, shoes. Crystal will be the voice of Mike again. 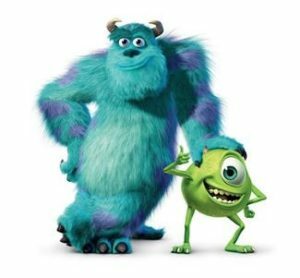 It’s for a new TV series called “Monsters at Work,” based on the movie characters. It’ll be available to view next year on a new streaming platform called Disney Plus, which is written as Disney +.